Exhibitions, plays, processions, demonstrations and other activities are being held as part of UNICEF supported Mine Risk Education (MRE) Week between 21 June and 27 June across the NorthEast province. In addition MRE stickers, key tags and T-shirts with messages advocating a total ban on mines have also been produced and are being distributed during this week, UNICEF sources said. 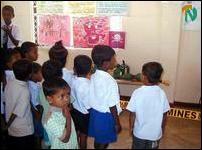 In Trincomalee district TV documentaries were shown in villages. 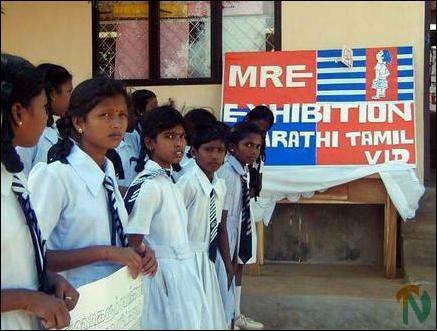 A MRE exhibition was held Friday morning in Varothaya Nagar Bharathi Tamil Vidiyalayam. Teachers, students and volunteers of the UNICEF and Save the Children Fund in Sri Lanka organized the MRE exhibition, sources said. UNICEF Trincomalee zonal head Ms Gabriele Elroy participated in the event. In response to the results of the MRE survey conducted in about 300 villages in Trincomalee district, UNICEF has been supporting the Mine Risk Education activities in the eastern district since 2003 through three partner organizations, White Pigeon, Community Trust Fund (CTF) and the Save the Children Fund in Sri Lanka (SCiSL), UNICEF sources said. White Pigeon and CTF work on village level with communities living in high-risk areas. Particular focus is given to areas of return, such as Thiriyai and Kanniya. Developing social maps is one way White Pigeon and CTF to work with people and make them share information on dangerous areas suspected to be contaminated of mines and unexploded ordinance (UXO). White Pigeon and CTF both establish self-sustained Mine Awareness Groups in the villages where they work. These groups consist of village leaders and other people who volunteer to support mine action activities in the targeted villages, UNICEF sources said. In Trincomalee district with the support of four local non-governmental organizations, Trincomalee District development Association (TDDA), Trincomalee District Young Development Aham (TDYHDA), Trincomalee District Gandhi Seva Sangam (TDGSA) and Surakuma, Save the Children in Sri Lanka (SCiSL) is implementing a child focused MRE programme in 20 schools and 14 children's Clubs. Under these programme 35 teachers, 72 MRE child animators and six drama groups consisting 68 children have been trained to spread the MRE messages through child-to child education. In addition, the field officers are facilitating the children from schools and children's clubs to conduct community mappings of their areas and create models of mine gardens in the communities, UNICEF sources said.